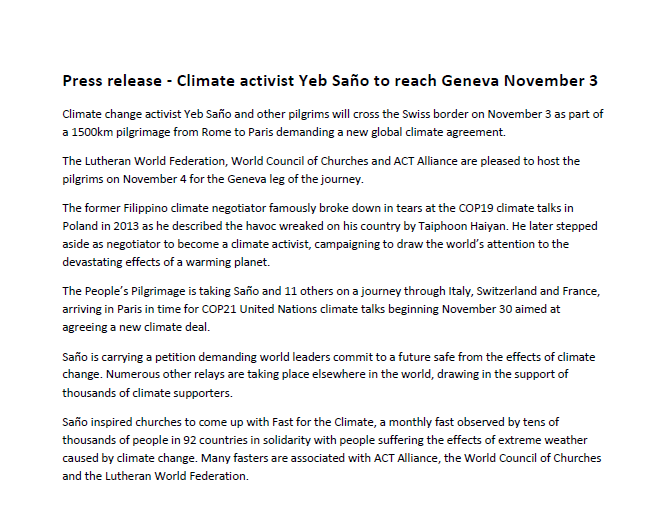 Climate change activist Yeb Saño and other pilgrims will cross the Swiss border on November 3 as part of a 1500km pilgrimage from Rome to Paris demanding a new global climate agreement. 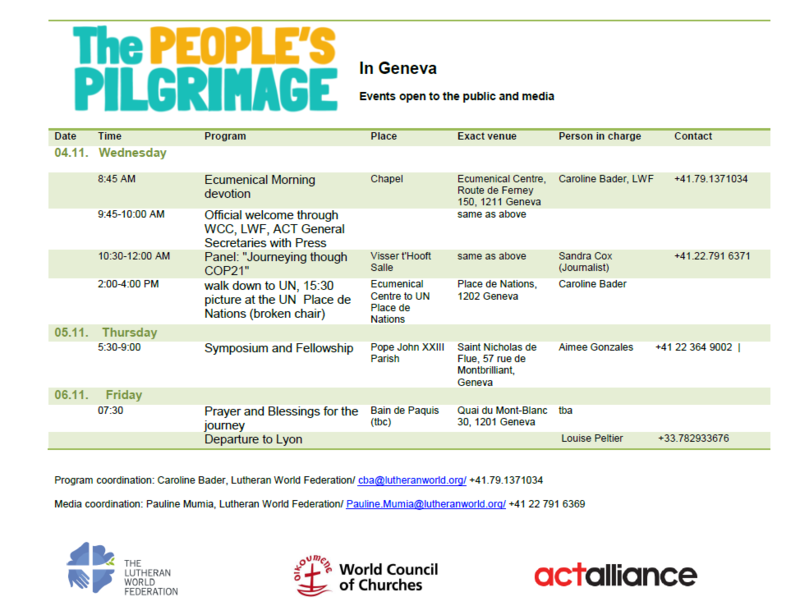 The Lutheran World Federation, World Council of Churches and ACT Alliance are pleased to host the pilgrims on November 4 for the Geneva leg of the journey. The former Filippino climate negotiator famously broke down in tears at the COP19 climate talks in Poland in 2013 as he described the havoc wreaked on his country by Taiphoon Haiyan. He later stepped aside as negotiator to become a climate activist, campaigning to draw the world’s attention to the devastating effects of a warming planet. The People’s Pilgrimage is taking Saño and 11 others on a journey through Italy, Switzerland and France, arriving in Paris in time for COP21 United Nations climate talks beginning November 30 aimed at agreeing a new climate deal. Saño is carrying a petition demanding world leaders commit to a future safe from the effects of climate change. Numerous other relays are taking place elsewhere in the world, drawing in the support of thousands of climate supporters. Saño inspired churches to come up with Fast for the Climate, a monthly fast observed by tens of thousands of people in 92 countries in solidarity with people suffering the effects of extreme weather caused by climate change. Many fasters are associated with ACT Alliance, the World Council of Churches and the Lutheran World Federation.